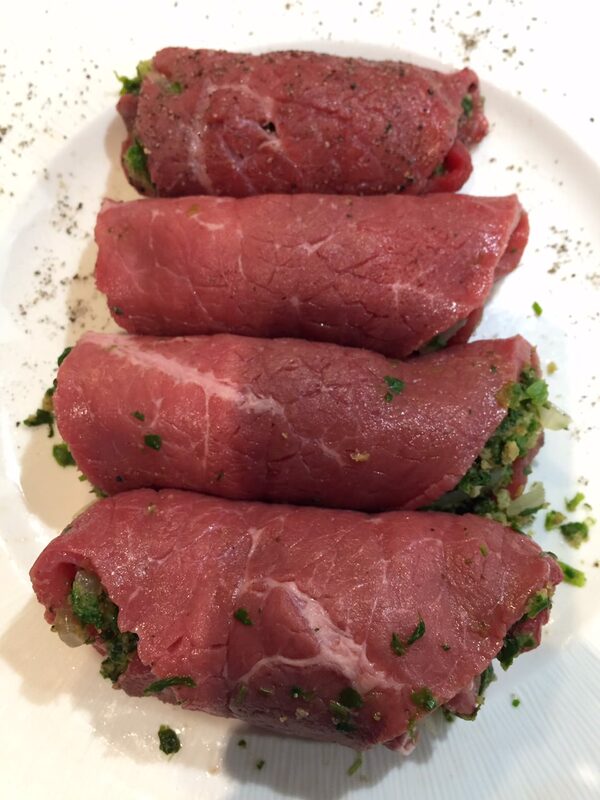 This is a multi-step recipe to make braciole, so pay attention and don’t freak out! In a frying pan, put in a glug of olive oil and fry off your onions and garlic over low heat, adding a teaspoon of oregano and half a teaspoon of basil. 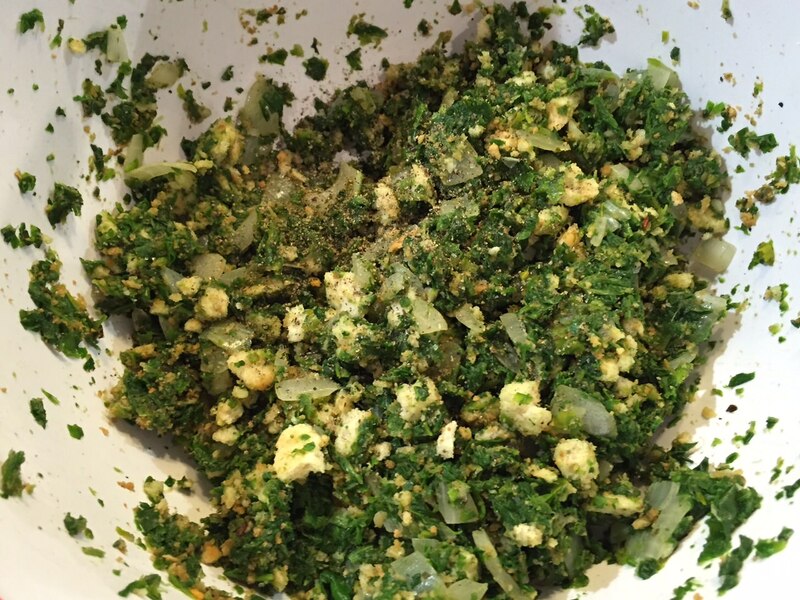 In a separate saucepan, cook down your frozen spinach and drain in a colander. When the onions are translucent and add the spinach and mix well. Transfer to a mixing bowl to cool and season with salt, pepper and chili flakes. Rinse your pan out and toast your breadcrumbs, when they start to brown off add them to the mixing bowl and combine thoroughly. Have a taste of the stuffing mixture and add more seasoning if needed. Blue Peter steak rolling badge, attained. Here comes your Blue Peter moment, Dear Reader. Take a dinner plate and season the plate with salt and pepper. Why season the plate? I find it easier to get an even coverage and it’s less mess, you don’t need to season the meat one side, flip them, wash your hands and then season them again. Hot tip Dear Reader, you can have that one for free. Get your steaks and flip them to cover them in seasoning and then get a handful of your stuffing mix. 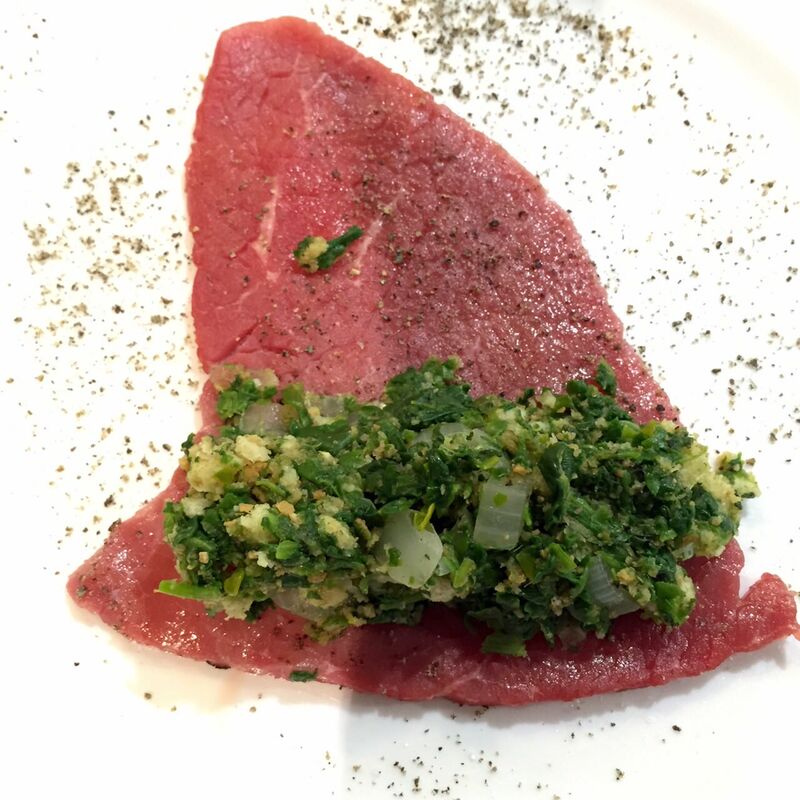 Starting on the widest side of the steak, pack down your seasoning and roll it towards the narrow end. Secure with toothpicks, everywhere, to make sure your stuffing won’t come flying out. It won’t look pretty, but it will work, trust me. Glorious braciole in the making. 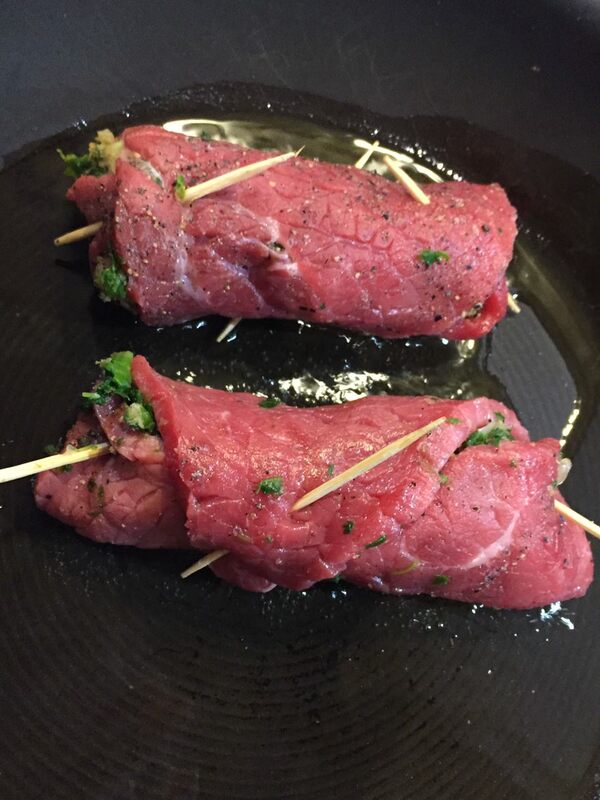 Once all your braciole are rolled, get your trusty frying pan and brown them on each side on high heat. 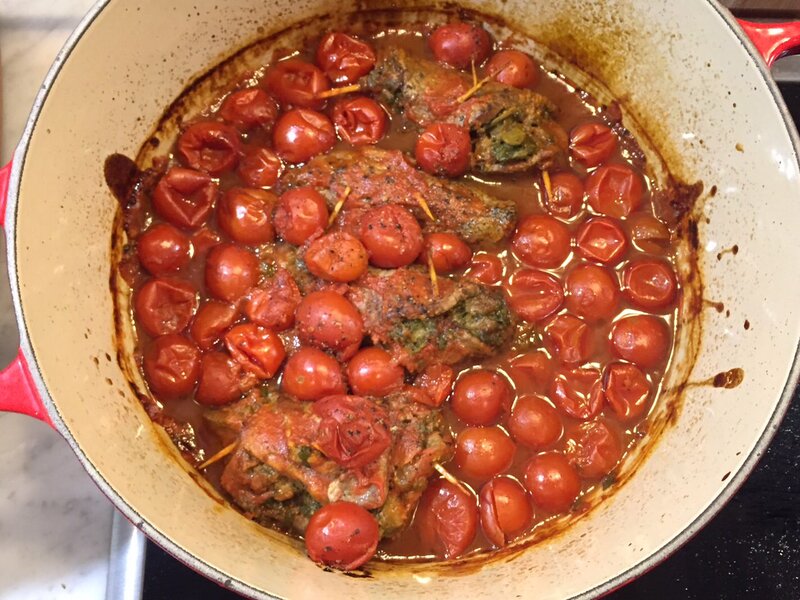 Empty half a can of cherry tomatoes into a baking dish and then place your braciole in dish then top with the rest of the cherry tomatoes, including the other tin. Add your wine, a pinch more salt and pepper and place in the oven for 2 hours on 160. Sit and sip wine for 1.5 hours. 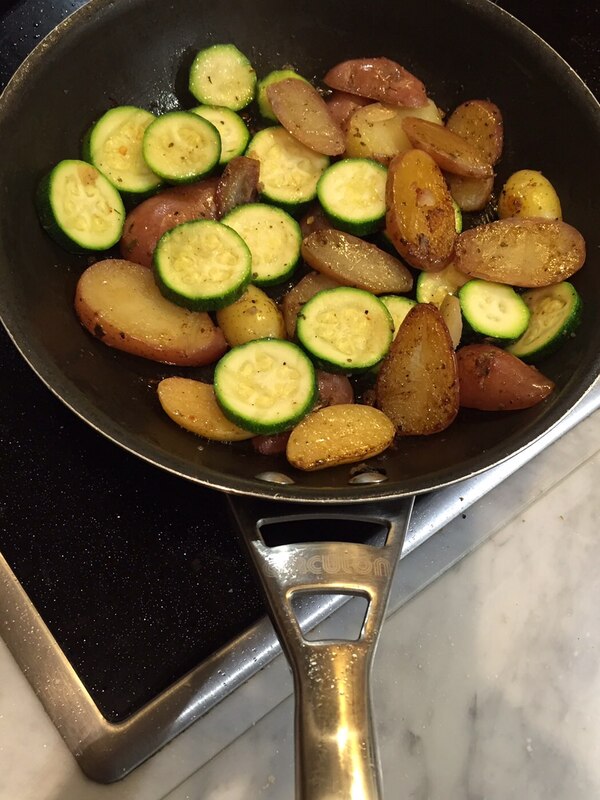 With 30 minutes left to cook, thinly slice your russet potatoes and your courgette. In your trusty frying pan, add you last clove of garlic and some oil to gently simmer. Place your slices of russet potatoes and start to heat through. Add a splash of water, a stock cube and stick the lid on. Leave for 10 minutes, flip them and add more water. Essentially what we’re doing is making a form of fondant potatoes but on the hob. Continue doing this and when the potatoes start to soften, add your courgettes and put the lid back on. 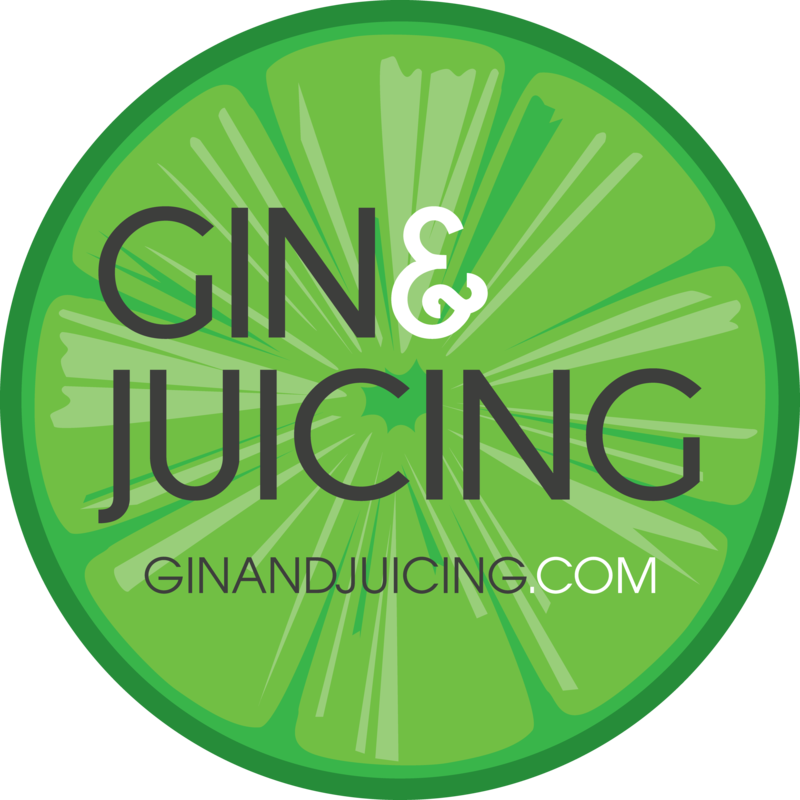 The best thing about this dish is that you can drink while it cooks. Clever Italians! 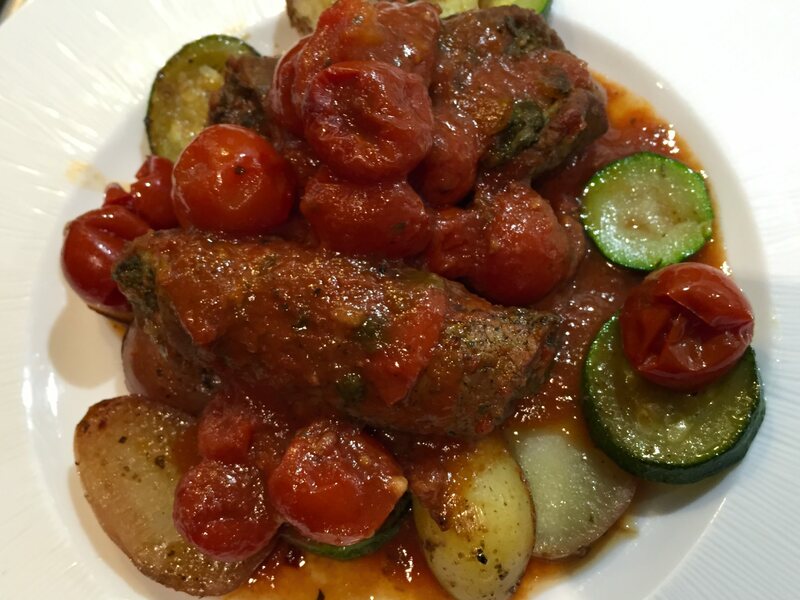 Get your braciole out of the oven, place your potatoes and courgettes on the plates and delicately place the braciole on top. Remove the toothpicks and top with the sauce from the baking dish. Add a grating of Parmigiano- Reggiano of top and serve. Buonissmio!